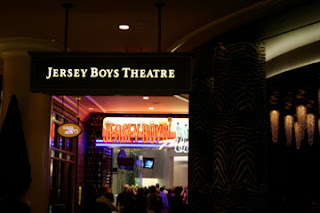 MSE Creative Consulting Blog: Happy 5th Anniversary Jersey Boys! 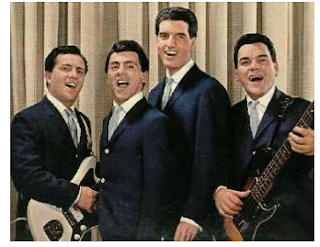 I have been a huge fan of The Four Seasons since the first time I heard "Rag Doll" in the summer of 1964. According to Billboard magazine, they rank #9 in hit songs (number of records on the Hot 100) of all artists since the magazine was created in the 1950's. In spite of that huge success, they were never "trendy" and didn't get the acclaim of many of the other artists of that era. In 2004, Kathleen and I traveled to La Jolla, California to see a show about Frankie Valli and the Four Seasons called "Jersey Boys." We were blown away. People were -- literally -- dancing in the aisles. Night after night the show was selling out and its run was extended multiple times. We got to stay after the show and talk to its creators and were excited when we learned they were going to take it to Broadway. 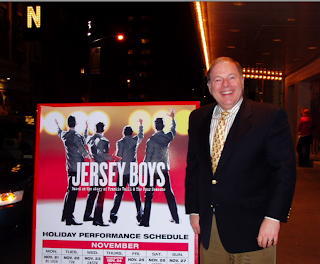 On November 6, 2005, "Jersey Boys" opened on Broadway. Six days later, Kathleen, Tiffany and I were in NYC to see the show and it was immediately obvious it was going to be a blowout hit. I spoke with boxing promoter Don King and CBS's Julie Chen that evening; they loved it, too. Now, 5 years, four Tony Awards (including best musical), one Grammy (best cast album), and $852,000,000 later, "Jersey Boys" is one of the biggest hits in the history of Broadway. If you haven't seen it, make sure you make it a point to see it when you are in New York, Vegas, the touring company, Sydney or London. This interview with Bob Gaudio, writer of most of their hits and the group's keyboard player, tells the story well. Here in Wichita, we will get an appetizer version of "Jersey Boys" on December 17 when the original cast comes to Hartman Arena to perform the music from the show. Where are the original Four Seasons now? Frankie Valli still tours, Bob Gaudio is still producing, Tom DeVito lives in Vegas and is in the music business, and Nick Massi passed away Christmas Eve 2000. Congratulations to the Seasons and the show's creators on five smash years. UPDATE: Coverage of the many fifth anniversary activities here. Want to make sure to see Jersey Boys at least one more time before it ends. I've already seen it three times. Had great our Jersey Boys Tickets (row D) from Ticketsinventory.com . Definitely want to see John Michael Dias as Frankie. He is absolutely unbelievable. Will he be playing until it ends in October? Hope so. Yes, he is supposed to play Frankie for the run.